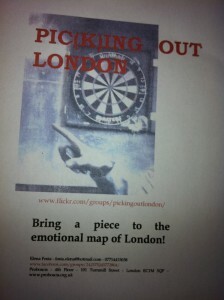 Last August I started planning and outlining the details of my personal project named Pic(k)ing out London. Alice and Giles helped me adjust and refine my initial blurred design, propelling questions and making objections in order to show me how intricate and elaborate planning even a simple project like this is. At first I was pretty enthusiastic about that as I thought I would have had the chance to test my ideas – how ever scattered and ephemeral they might have appeared – about urban interaction against the merciless reality. My aim was to select people from different backgrounds who have diametrically opposed points of view of London. That meant avoiding close friends or at least I meant to pick only a few and try to differentiate my recipients as much as possible. That again meant that I should run through different channels in order to recruit people who could possibly match my criteria and expectations. At first I sent emails to contacts I was provided by Giles and Alice and although the response was quite poor from the beginning I was at least pretty satisfied with the initial goal achieved: yes I had found six people willing to take part in the project (being six the minimum threshold we had set) and even if among those six there were some acquaintances or some friends of a friend they altogether formed a varied lot! How ever promising it could be, it was not destined to last long. People disappear, they don’t get in touch or, when they do, they vainly assure me they will eventually do it. People then abandon the project along the way for various reasons and I should say I soon realized I was not in a favourable junction at all as all sort of unfortunate circumstances seemed to come together: computer crashes, camera breakdown, memory card not inserted and many other personal misfortunes. In order to compensate for this ever weaker inflow of material Alice and Giles advised me to enlarge both the scales of time of the project and the spectrum of potential participants by adopting less-beaten methods to recruit and involve people. We cut the days people had to commit and proposed a 5-days, one-weekend or even a one-day involvement. Besides I tried to broaden my horizons by contacting associations and various community clubs, posting on different websites, boosting the group Facebook and Flickr pages, approaching strangers on the streets and handing out flyers. I should admit that I also went back to those very friends I had at first neglected and begged for help. However, as hard as I tried, it just did not work! After the inevitable discouragement and frustration, I became aware that a reflection about the reasons why the outcome shattered my anticipation was absolutely indispensable and, all things considered, it was the only thing left to do. Giles and Alice were not of secondary importance in this process, as they always tried to make me understand that a marginal failure is unavoidable and predictable when doing projects that require the involvement of people. As long as you stick to your ‘sacred cows’, you have to be flexible and adapt your ideas to any change of circumstances which may occur. As the project was initially designed, it was perhaps too demanding, too specific and not so straightforward as I thought it was if you consider working with people from a distance. This implies an autonomous effort from their part and if the tasks are a bit challenging they may easily get lost and lose interest in the project. Then it is mandatory to understand how people have their own concerns and duties to care. Therefore in a situation where the participants feel no obligation whatsoever, apart from being a mere act of helpfulness, and they see no reward in actually accomplishing the task, it is too tricky to trust in their complete commitment. Now I guess that having worked with a closed community would have made a great difference as people might have felt duty bound to carry out the research and might have found mutual help and support. I have also reflected about my own attitude towards the whole project and in particular the strategies I adopted to convince people not just to say ‘yes, I’ll do it’ but to feel positive and intrigued by the principles and values of the whole plan. I therefore recognize in my own approach some flaws due not so much to a lack of faith in what theoretically underpins what I was doing, but mainly due to my own inexperience in translating some abstract concepts to a more varied audience. I feel that people outside the ‘field’ may find this sort of engagements quite silly or, at least, useless and unfruitful. So the puzzle, still unsolved, is: how to connect with people who may be, initially and on principle, suspicious and uninterested? How to make my aim and desire be understandable to a wider arena? This enigma and my own unfamiliarity obviously made my conviction in the project be full of ups and downs and inevitably led to a poor and visible self-confidence. And that is not the ideal tack to prompt someone to complete a task! Moreover, the continuous alterations on strategies adopted, in order to make up for the scarce response, did nothing but weaken my ease. To be honest, one should take into consideration other factors to explain why it did not work as expected, such as the time of the year (it started in August when most people are on holiday) and a bare series of misfortunes which had diverted my initial idea. Anyway, I think it is essential to be critical and analytic towards both the context and one’s own faults. What I can say is that I would definitely like to put myself on the line again and test my unresolved issues if the occasion arises in the future and now I am confident that from this disastrous experience I may learn something precious. Most of all, I should learn not to take for granted what I used to and to ask myself those very questions that the project helped to bring to the surface. Finally, I want to thank those who, despite snags, helped and supported me and those who did contribute to the project by sending me pictures and diary entries.